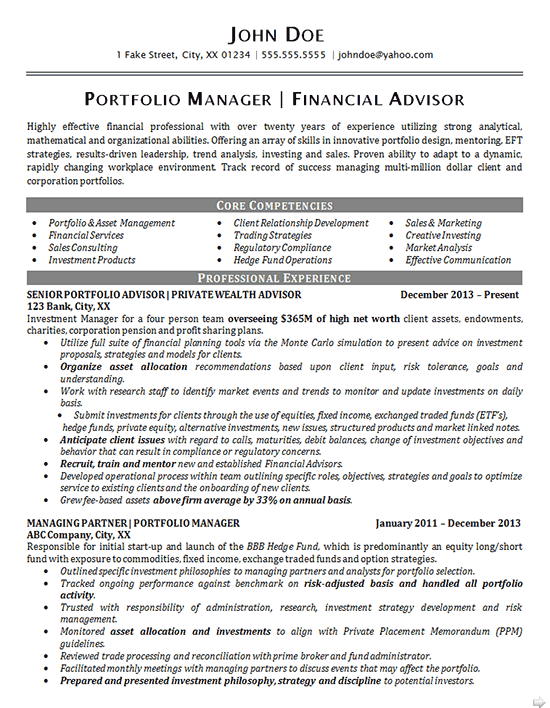 This Portfolio Manager Resume was created for a financial professional with aspirations of continuing to move up in his field. Typically, the client stayed at a job for about five years before attempting to find a more attractive job elsewhere. Financial Advising incorporates a highly specific set of necessary skills and knowledge base. This resume was designed to showcase how well this client meets those specific demands through a well-explained introductory statement and Core Competencies section. The phrases in the Core Competencies section were carefully chosen to match both the client’s skill set as well as specific terms used in job descriptions of interest to the client. From there, a detailed breakdown of accomplishments and responsibilities were listed in the Professional Experience section. Critical points were written in bold and each position was thoroughly explained. This format was utilized because many high-level advisors will be applying to positions of interest such as wealth manager or asset management jobs. To give him an advantage, we wanted to really show off how accomplished the job seeker is in his field. 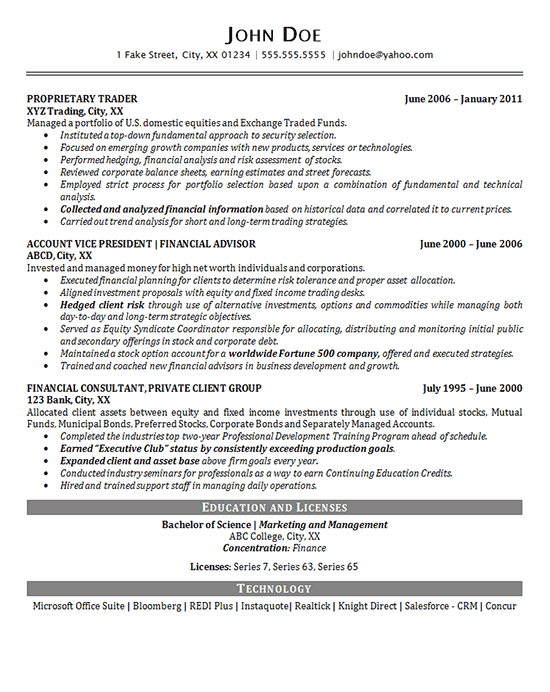 To conclude the resume, Education, relevant Licenses and Technology were listed to round out this client’s profile. Highly effective financial professional with over twenty years of experience utilizing strong analytical, mathematical and organizational abilities. Offering an array of skills in innovative portfolio design, mentoring, EFT strategies, results-driven leadership, trend analysis, investing and sales. Proven ability to adapt to a dynamic, rapidly changing workplace environment. Track record of success managing multi-million dollar client and corporation portfolios. Utilize full suite of financial planning tools via the Monte Carlo simulation to present advice on investment proposals, strategies and models for clients. Organize asset allocation recommendations based upon client input, risk tolerance, goals and understanding. Work with research staff to identify market events and trends to monitor and update investments on daily basis. Submit investments for clients through the use of equities, fixed income, exchanged traded funds (ETF’s), hedge funds, private equity, alternative investments, new issues, structured products and market linked notes. Anticipate client issues with regard to calls, maturities, debit balances, change of investment objectives and behavior that can result in compliance or regulatory concerns. Recruit, train and mentor new and established Financial Advisors. Developed operational process within team outlining specific roles, objectives, strategies and goals to optimize service to existing clients and the onboarding of new clients. Grew fee-based assets above firm average by 33% on annual basis. Outlined specific investment philosophies to managing partners and analysts for portfolio selection. Tracked ongoing performance against benchmark on risk-adjusted basis and handled all portfolio activity. Trusted with responsibility of administration, research, investment strategy development and risk management. Monitored asset allocation and investments to align with Private Placement Memorandum (PPM) guidelines. Reviewed trade processing and reconciliation with prime broker and fund administrator. Facilitated monthly meetings with managing partners to discuss events that may affect the portfolio. Prepared and presented investment philosophy, strategy and discipline to potential investors.